Trying to stay up to date with the entomological fauna in my area, I went for an extended hike, braving ankle-deep waters and wading upstream from my usual haunts. 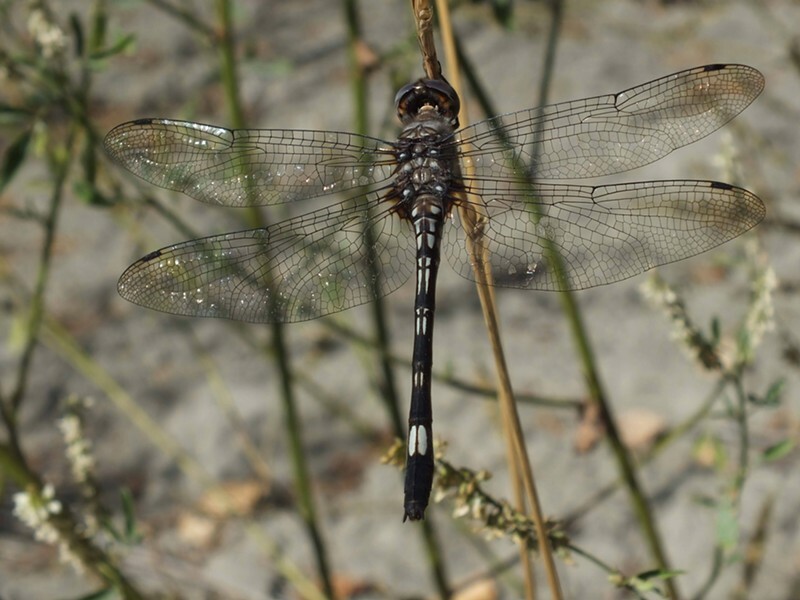 I saw quite a few pale-faced clubskimmers (Brechmorhoga mendax), one of my many favorite dragonflies. You usually see them flying within inches of the surface at the downstream end of large, smooth flats on the river. As fast as they are, the best I could do was set the camera for a rapid fire series of exposures and blaze away, hoping the auto focus could keep up. The clubskimmer in action — note its reflection on the water. 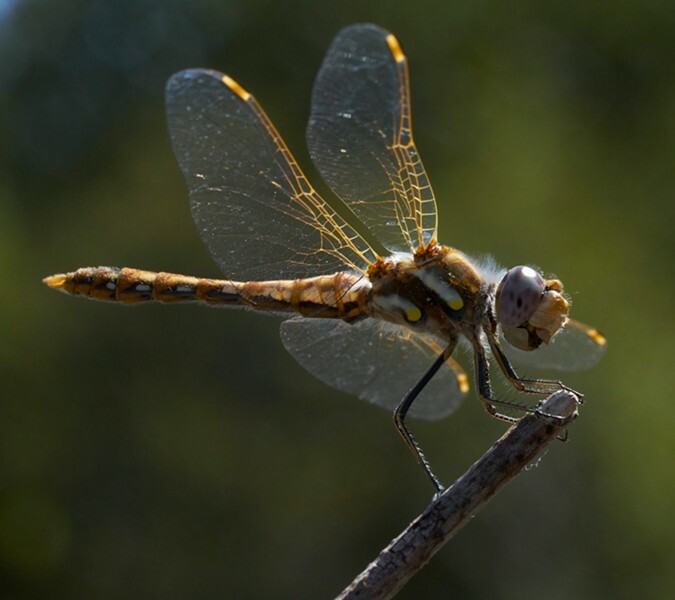 In contrast to the medium-sized club skimmers, one of the smallest dragonflies in our area, variegated meadowhawks (Sympetrum corrupt) wait on something affording them a good vantage and dash out after smaller flying insects, often returning to the exact same place over and over again. I think the specimen I saw today was the individual I saw last week on the same snag. Nasty little bugger that bit my foot: a tiny creeping water bug nymph. Farther up river, something started really hurting on the top of my foot under a sandal strap. 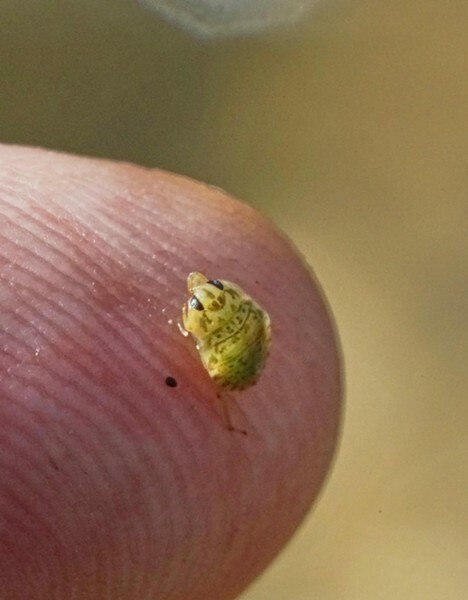 I thought it might be a bit of sand or a burr, but when I fished it out I found a tiny creeping water bug nymph. They are not known to attack humans and my foot seemed no worse for wear an hour later. 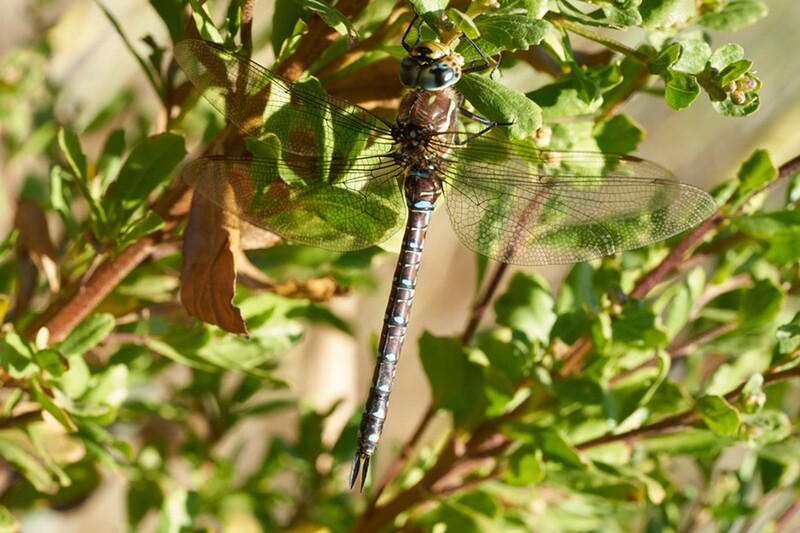 A darner in the leaves. Near the end of the day's hike, I noted a large dragonfly acting like it was seeking a place to bed down. Darners, as a group, patrol an area and seldom land until evening. It headed into a single small bush of coyote brush. I studied the plant for several minutes, seeing nothing. 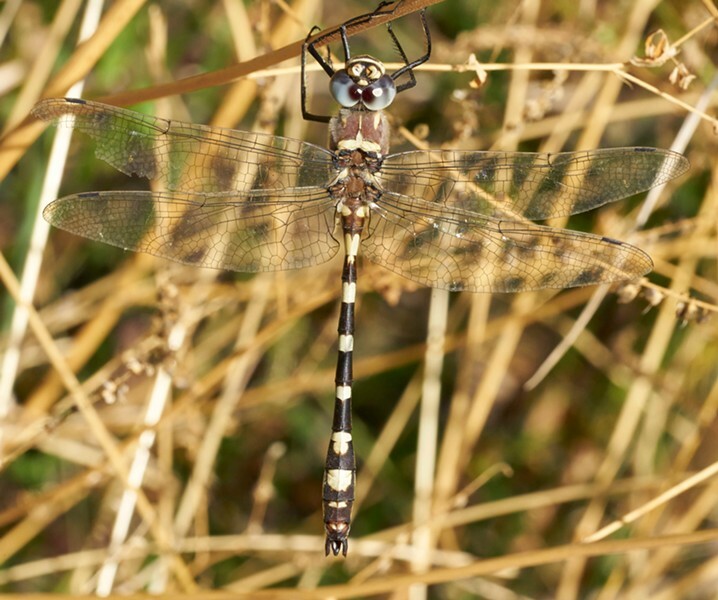 As I was turning to go, like Waldo in the Where's Waldo pictures, it snapped into focus, despite the fact that it has bright blue markings and it had been hanging there in front of me all the time (genus Aeshna). Finally, a Western River Cruiser (Macromia magnifica), flitted by me and, like the darner before, acted as if it were seeking a place to land. I've been seeing members of this very large black and yellow species patrolling a foot or so off the ground along dirt roads for over a month now. I stood still and watched as it flitted between low branches landed. On close examination, the picture shows this one has some mileage on his wings. By the time I got home my feet were sympathetic.